Question: How Do You Do It All Well? Answer: I Don't. Last week I received a message from a friend. She and I both work full time. We're both raising three daughters. We're both married to men whose jobs require late or nontraditional hours, so we navigate many dinners, evenings, and bedtimes with our kids alone. She's several years younger than me, though, and her children are several years younger than mine. On that premise, she asked: "How do you do it all well? I know I'm where I'm supposed to be, but I'm in the thick of it. 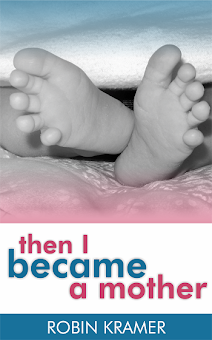 I need to look to women a bit ahead of me who haven't shrunk back in spite of motherhood, but have stepped up, so to speak." I wish that a picture could have been taken of me the exact moment I read her message. I was standing in my kitchen, stress-eating a handful of crackers because I couldn't find any chocolate to stress-eat. I was nowhere near finished with my work for the day. Dinnertime was near, yet I had no meal planned and limited groceries. One daughter needed to be picked up from swimming intramurals. Another daughter needed help with math homework. We had an event at church that evening, plus I had entirely forgotten about a Girl Scout ceremony (conveniently scheduled at the exact same time as church) even though I had received multiple reminders about the ceremony, all of which I had forgotten to RSVP. How do you do it all well? The answer to that question was straightforward: You don't. You just don't. You learn to do most of it well enough, but you never quite do all of it to your high expectations. Because "it" is huge. 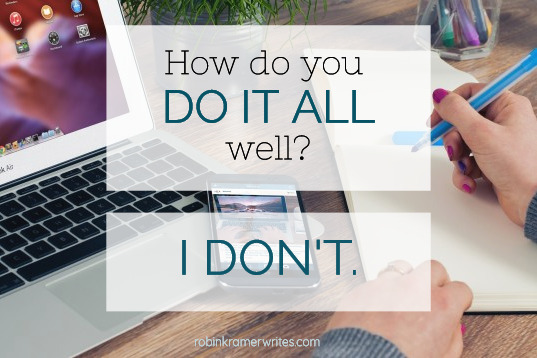 The "it" in "how do you do it all well?" is mammoth. It's comprised of unwieldy to-do lists for work, home, and, if you have kids, each individual child. The "it" represents hundreds of daily decisions, both small and large, from what to serve for dinner, to how to proceed with a conflict at work, to how to discipline a difficult child's behavior while still showing love. "It" stands for the dishwasher that needs to be emptied, the school picture order form that needs to be returned, and the class that needs to be taught the next morning. "It" means that you have answers to all possible questions, like you're a human Google who can provide detailed weather reports so your kids know exactly how to dress each morning, or identify the species of a native deciduous tree by its leaves so you're poised to assist your middle schooler who's completing a science project. Inherent in the "it" is that you take care of yourself (obviously!) and prioritize your marriage (so important! ), while also spending quality time with each child to invest in their academic, social, spiritual, physical, and emotional well-being. And, in those cozy spare moments as you ease into bath time and approach the sweet bedtime hours, "it" nudges that, while you're at it, you ought to read with your children for 20 minutes (keeping a log of book titles, of course) because, friends, reading is good and educational and fun! So, as I paused at my kitchen counter reading her message and processing how I do it all, I laughed aloud -- one of those slightly manic laughs that, if witnessed by an outside observer, would make them question whether I was entirely balanced. Dear friend, you don't do it all. Somehow, you learn to live comfortably in that realization. Not throwing in the towel, not giving up, but also not holding yourself to impossible standards. You have amazing capacity. You've established a diligent work ethic that sets you apart, and your high level of competence has been rewarded by getting entrusted with more work. On top of that, God's blessed you with three spirited children who bring such joy, yet require such time, energy, and effort. And you have a husband and a marriage to cultivate! And there's church and ministry! And there is laundry -- so much laundry! -- and dishes and meal prep. And you still need to shower and groom! There's no wonder why you feel as if you can't do it all -- there is only one of you. And even in your amazingness, it's not feasible to always have all of these plates spinning well. There's going to be some wobble. When we're feeling especially overwhelmed, don't we all need someone to tell us that the wobble is normal and inevitable? That wobbling is not an indicator that we're failing, but rather, that we're somehow keeping worlds in motion? I was reminded of a scene a few semesters ago when I had an undergraduate teaching assistant who handled some instructional and clerical tasks for a course I was teaching. After our students had taken an exam, he emailed to ask if he could grade the exams by the end of the week, not the very next class session. He was a terrific student and TA -- always diligent, always helpful, always on top of things. He simply needed more time. I immediately accepted his request: Of course you can have an extra few days to grade the exams. It won't hurt anyone. Your week is hectic; I know you'll get it done as soon as you're able. Even as I responded, I realized that I was being more gracious with him than I would have been with myself. I would have expected myself to grade the exams that night, regardless of my schedule. In both of these situations -- my friend's challenge to balance work and motherhood, and my TA's challenge to meet a deadline -- I could easily understand their struggles. They're remarkably competent people, both of whom have a lot on their plates. It's natural for me to offer them encouragement and leeway. How could I not empathize? My responses made me wonder: If I can do this so readily for others, why can't I also give myself the benefit of the doubt when I face challenges? Why can't I easily let go of my self-imposed expectations, especially when those expectations are arbitrary or unreasonable? I think it's because, deep in my heart, I still want to do it all well. I want my all plates to spin perpetually, not to wobble. Remember that time you crawled out of bed at night to change the wet laundry from the washer into the dryer? Remember that? That was impressive. How about the morning when you knew the exact location of your son's missing homework folder? Not everyone would have remembered it was on the third step, sitting next to the pile of socks that you had gathered from the family room floor. And what about that evening when you desperately wanted to watch an episode of Worst Cooks in America: Celebrity Edition, but instead you laid in bed beside your children, rubbing their backs and listening to them talk about their days? You. Are. Amazing. I don't think we celebrate or notice the many things we're doing well, though, because we're already rattling off the next set of expectations, like how we now ought to fold the clothes we had put the dryer, or wash the dirty socks sitting on the steps, or hold off viewing Worst Cooks in favor of checking email once more. Let's break that perpetual cycle. Let's notice the things we're accomplishing, not just what we aren't. You might not be doing it all well, whatever "it" looks like for you. Neither am I. Nobody is. We all have plates that are wobbling, falling, or shattering at our feet. We mostly see our own messes up close, not everyone else's, which makes us feel more isolated. Truth is, we're all in the thick of life. Mess and struggle is inevitable. So, let this post be a reminder to you -- just like it's a reminder to me -- that we can be kind to ourselves. If you can't hear your own voice telling you this, then let mine resonate through the screen today: Have you noticed how much you're doing? You're killing it in so many areas. You're doing it, my friend. Maybe not all, and maybe not entirely well, but you're doing it. And today, that's entirely a victory. Exactly and I agree with your post 100%, we should be kind to ourselves first because if we cant be kind to ourselves than how can we able to be kind to others? Yes, self-kindness is a good start, is it not?